It was honours even between Coleraine and Glentoran in a disappointing game at Thw Showgrounds. Both sides had penalty shouts inside the first three minutes, neither was given by referee Tim Marshal though. With only 40 second on the clock Ian Parkhill looked to have been impeded by Johnny Addis as he race through on goal. And at the other end just two minutes later David Scullion seemed to be upended by Aaron Canning, again though nothing was given. Curtis Allen tested Michael Doherty with a free kick on nine minutes. Steven Gordon fired the visitors in front on 22 minutes as he latched on to Fra McCaffrey’s clever pass before slotting past Doherty. Coleraine were struggling to create much on a heavy pitch. Their first reall opportunity arrived on the half hour as Darren McCauley’s deep cross fell for Shane McGinty, but he was crowed out as he tried to gte his shot away and Elliott Morris safely gathered. The Glens keeper had the woodwork to thank for keeping his side in front just four minutes into the second half. Matthew Snoddy sent McGinty racing clear, he got his shot away from a tight angle but it stuck the far post and bounced away to safety. Coleraine had a let off on 68 minutes as Gordon weaved his way down the right-hand side before pulling the ball back for Scullion, his goal-bound effort was blocked by teammate Curtis Allen a yard from goal. The Bannsiders got themselves back on level terms with eight minutes to go. 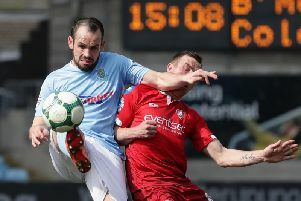 Morris could only parry Gary Browne’s powerful effort from outside the box, and Darren McCauley reacted quickest to slot home the rebound and earn his side a share of the spoils. Coleraine: Doherty, Canning, Mullan, Beverland, Douglas, Higgins, McCafferty, Snoddy, McGinty (Miskimmin 60), McCauley, Parkhill (Browne 76). Glentoran: Morris, Kane (Garrett 77), McCaffrey, Birney, Scullion, Allen (McKee 88), McAlorum, Addis, Nelson (Stewart 74), Gordon, Holland.